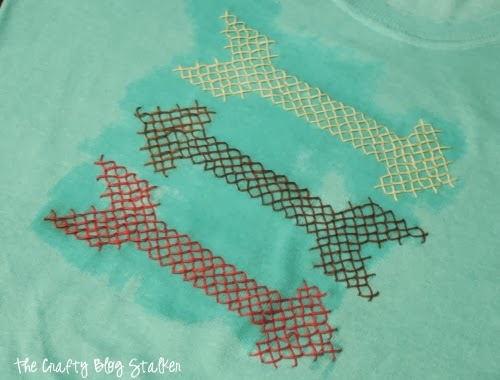 Add a DIY Cross Stitch design to a shirt or sweater! 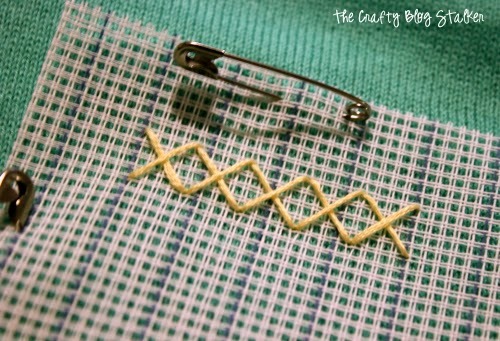 An easy DIY craft tutorial idea with a modern cross stitching pattern included! Have you noticed that Cross Stitching is coming back? I use to Cross Stitch a lot when I was younger, but I hadn’t done it in ages. 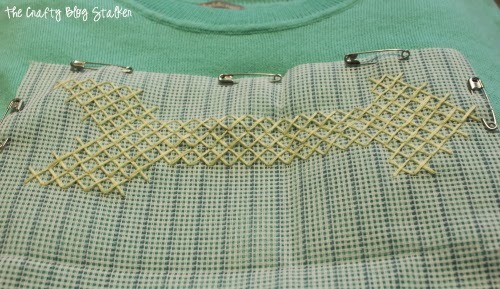 That is until I got the idea for this super cute Cross Stitch Sweater. 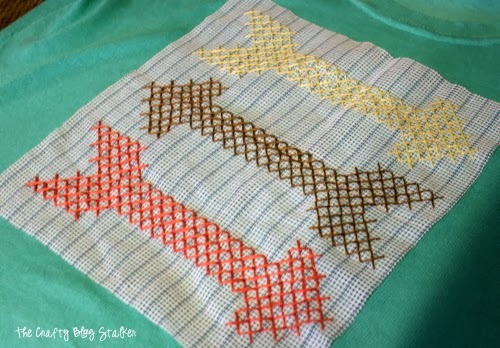 I dug into all of my old Cross Stitch supplies and found some Tear Away Waste Canvas and 3 colors that would go well. I love it when I already have everything in my stash that I need. The pattern for the Arrows I got from Storypiece. She has a link for a free download. The first step is to pin the waste canvas to the front of the sweater. I wanted to make sure that it was secure and wouldn’t move around so I used a lot of safety pins. Be very careful not to snag the sweater. Then begin stitching. I wanted the X’s to be bigger than the canvas, so my X’s actually covered 4 holes on the canvas. I like to stitch in rows, so this is the first line of stitches in the first row. Then I went back with the other stitch, making the X. Here is the first Arrow, it already looks so cool! The middle arrow I changed directions from the pattern, so they didn’t all face the same direction. The last step takes a little bit of patience. The waste canvas comes apart pretty easily, it just takes time. It helps to get the canvas wet and it comes apart even easier. To remove the waste canvas, pull one string out at a time. I found it easier to carefully cut between the arrows and only work on one arrow at a time. Yay, it is all Done! Only a little wet. So I let it dry overnight. The next day it was all ready to wear! I got so many compliments on my Cross Stitch Sweater! I absolutely love how it turned out! 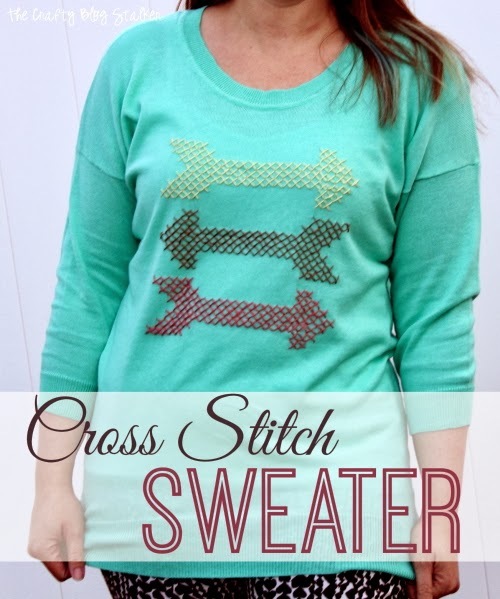 What Cross Stitch Pattern would you like on the front of your sweater? Share and leave a comment below! 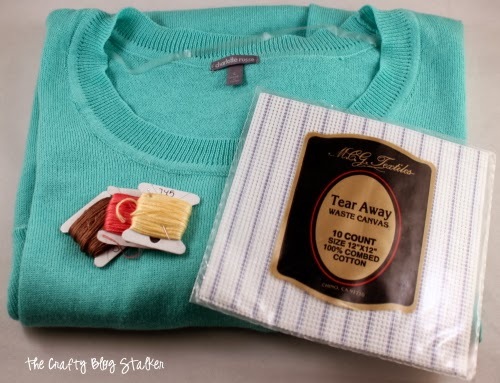 SAVE THIS CROSS STITCH SWEATER TO YOUR FAVORITE DIY FASHION PINTEREST BOARD! This is MAD cute, Katie! Love all the colors you used! love this!! I’ve been wanting to dig up my cross stitching stuff too and this may just be the perfect project! Thank you so much for sharing at Making Monday! Oh wow! Seriously cute! I would love to try this for me and even my two girls! What an adorable sweater! I had no idea that they made tear away canvas. 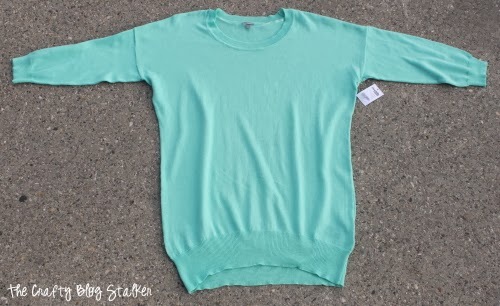 I was just thinking about doing a similar sweater/shirt for my daughter, and your idea to use the tear away canvas is so perfect! Thanks for sharing! Wow! I am hugely honored. This is a fabulous look and I’m so humbled that my little pattern inspired it. I love that you mixed up the direction of the arrows too. That is so cool! I never knew that they made tear away canvas. Your sweater turned out awesome!!! That turned out sooo cool! I love it. Thanks for linking it up at Monday Funday! I HAVE noticed more cross stich projects lately. I guess I need to pull out my old stuff. Love the arrows on the sweater. I found you via Artsy Corner. This is such a cute sweater! I haven’t cross stitched in 15 years. But I’m thinking about pulling it out for this. Wow! I love this! I used to cross stitch all the time, but haven’t done it in years. My daughter would love this! What a fun idea! I’ve never seen/used that canvas before so I wouldn’t have thought to try this. This is such a cute idea! Pinning! Have a great weekend! Such a fun idea! Thanks for sharing at Fridays Unfolded! That is a super cute idea! thank you for sharing such a fun idea. Perfect idea for those of us who desire to be crafty but suffer from a creativity deficiency;) Could you explain why you use the waste canvas? 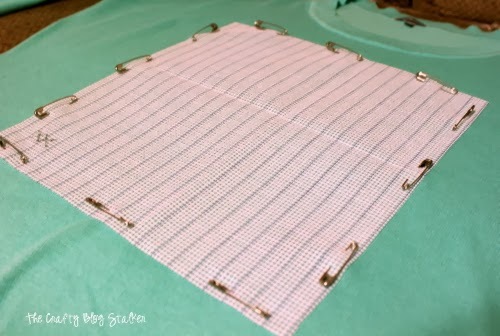 My daughter and I are new to cross stitching – why can’t I stitch directly onto the sweater surface? Thank you in advance for helping! This is so cute! 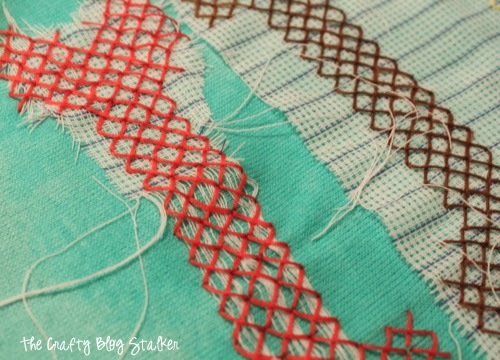 I love hand stitching of any kind. I’ve never seen that tear away canvas before, but I’m going to have to be on the lookout for it next time I go to the craft store. This is awesome! I’m glad I found your site. I just bought a package of tear away waste canvas at a thrift store and was looking for ideas to use it. I didn’t even know it existed. You just gave me a great idea. Thank you! You are welcome Vivian! I would love tos ee what you come up with. I used to cross stitch all the time but haven’t in a long time! Might have to take it up again! That was the same with me Roseann! It was fun to get back into it again. Super cute sweater! Thank you for sharing on Merry Monday! Have a great week! Thank you Kim! It was fun to do a little cross stitch since had been so long! Thank you, Kim! I am so glad you like this DIY fashion. Super cool! I’ve never heard of waste canvas but will be adding it to my list for my next trip to the craft store. Pinning. Visiting from Welcome Home Wednesday party. Thank you Victoria! I’m glad I could introduce you to a cool new product! This is so cute! 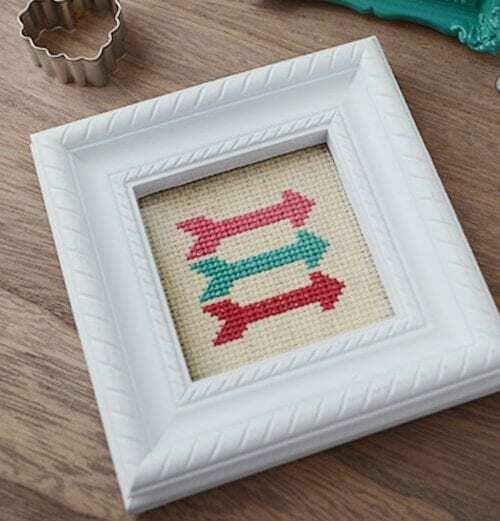 Love arrows and the cross stitch design really makes it unique! Thanks for sharing on Funtastic Friday! Thanks Heidi! It was really a fun project to make and I love wearing it too. Thank you! It was a lot of fun to make and I get compliments on it every time I wear it! hi I wanted to know if you sent emails to your boxes. till we can follow you. Thanks Joie! Yes, I do have a newsletter. Go here to sign up: https://madmimi.com/signups/188482/join It goes out every week on Wednesday. 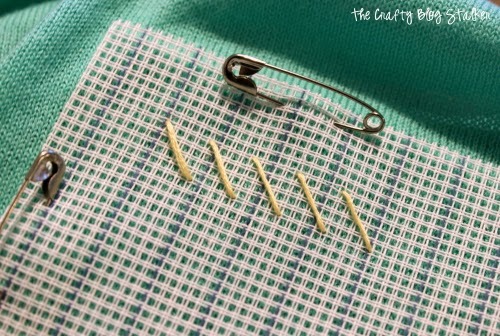 Katie, hands down for this post, this is such a wonderful idea, i have many plain blouse and i dont wear them because they are plain but cross stitching on them will help me to wear them. Thanks for such a beautiful idea. I will subscribe to your blog for more posts like this in my inbox. I am so glad you love this idea Hannah! You should post pictures, I’d love to see what you made!